Ever since Tesla publicly revealed a new all-electric semi truck last month, major companies have been lining up to place a pre-order, ahead of the projected 2019 production date. On Thursday, beer maker Anheuser-Busch joined the growing list. UPDATE: We will be adding to this list as more orders come in. Anheuser-Busch said it reserved 40 Tesla semis—at $5,000 per reservation—as part of a wider effort to reduce fuel cost and vehicle emissions by 2025. The order’s one of the largest known reservations Tesla has taken since CEO Elon Musk revealed the trucks at a glitzy party held last month at the automaker’s California factory. While it represents only a fraction of the larger market for heavy-duty trucks, as the Wall Street Journal points out, Tesla’s pre-order list for the electric semi has continued to grow. Anheuser Busch — It’s not yet clear whether the company will purchase the 40 semis outright, or if they’ll be leased, but the objective is to include them in a fleet that, the company says, will help reduce its operational carbon footprint by 30 percent. PepsiCo — The soda and snack behemoth ordered 100 semis. Sysco — The food distributor placed an order for 50 semis. Meijer — The Michigan-based grocery chain said the night of Tesla’s semi release party that it pre-ordered four trucks for testing purposes. JK Moving — Based in Washington, the moving company has ordered at least four semis. 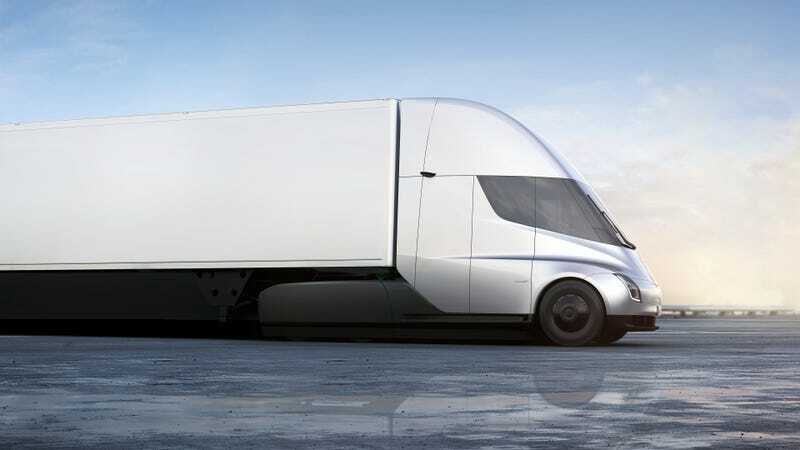 Fercam — The Italian trucking company reportedly pre-ordered a single semi, even though Tesla’s reportedly building the trucks to North American specifications. Girteka Logistics — Another Europe-based transport company, Girketa reportedly also placed a pre-order for one Teslas semi. Ryder — The company hasn’t said how many semis it pre-ordered, only telling the Wall Street Journal last month that it was “in the process of placing its initial order for a fleet” of them. DHL Supply Chain — The logistics trucking company pre-ordered 10 semis, reportedly with the intention of testing them on longer runs and evaluating their driver’s response to them. Fortigo Freight Services — A Canadian logistics firm, Fortigo told the Wall Street Journal it ordered a single Tesla semi. Flexport.com — The CEO of the shipping logistics firm announced on Twitter that he ordered one semi for the company. Best Transportation — The New Jersey shipping company announced on LinkedIn its single Tesla semi order. Mecca & Son Trucking — One of the employees of this family run business sent Jalopnik proof-of-purchase of a Tesla semi purchase. All told, by that count, Tesla has at least 140 semis pre-ordered. The automaker hasn’t officially released a reservation count. Tesla says the trucks will start at $150,000 with a 300-mile range; at $180,000, the trucks are expected to pack a 500-mile range. Those are set as “base” prices, though, so, similar to the Model 3, there’s likely to be some fluctuation when add-ons are taken into consideration. At the launch event, Musk touted the 0-60 speed of five seconds, and the trucks will come equipped with Tesla’s semi-autonomous Autopilot suite. The trucks have a centrally-mounted seat, which positions the driver like they’re in a McLaren F1. For what it’s worth, according to Musk, the trucks can withstand a thermonuclear explosion. Tesla’s planning to install new “Megachargers” that, Musk said, can restore the vehicle with 400 miles of range in about 30 minutes. Not every trucking company’s buying into the idea of an all-electric semi just yet. Operating with slim margins, there’s numerous outstanding questions of just how feasible the Tesla trucks are for business. “We’re going to sit on the sidelines and watch that develop,” James Welch, chief executive of truckload carrier YRC Worldwide Inc., told the Wall Street Journal. Welch seemed particularly concerned with having to stop and recharge the vehicles. “Recharging time has to be quick because you’re paying a driver whether he or she is running or sitting,” Welch told the newspaper. Nevertheless, there’s clearly a willingness to see how the trucks perform. Musk said the trucks will be available by 2019—around the same time the list of Tesla’s supposed to be approaching the end of the Model 3 deposit list, beginning production of the Model Y, and prepping production of the new Roadster.